Notes: The last time I had the eggless panna cotta, it was buttermilk and vanilla version. While this version is probably more appropriate for the warmer weather, I prefer the more yogurt tangty buttermilk version. The dried cherries were a little confusing - with such a summery light version, I would think that a fresh fruit compote - prehaps even lemon - would be more appropriate. 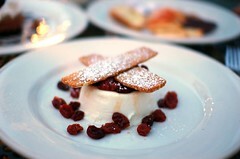 Nonetheless, beside the gelati and sorbetti selection, it's probably my favorite dessert on Lidia's menu. NB: This dessert is not offered as a part of the Monday night "Tuscan Grill" fixed price menu.